This is our team after our first two wins at Hollins. We started #15. We finished #5! Next week: We go to Uturn March 18th! We can't wait! All results, pools, etc. for all ages can be seen here. Thank you for sharing a few moments with us. Some sites have very strict food/drink policies while others may be more lenient. Please be respectful of tournament staff who will provide further instructions at each site. Specifically, the Roanoke Civic Center, Spectrum Sports Academy, and Patrick Henry HS will NOT allow any outside food/drink in the building with the exception of water bottles for players. The RCC will be searching bags/purses to enforce this policy upon entrance and there is a separate entrance for players to speed up their entry. Concessions are sold onsite so don't try to sneak in your morning coffee or fast food lunch. :) Also, no chairs are permitted inside Patrick Henry HS but bleachers are provided. After our 1st pool Sunday morning! We're ready for gold playoffs! We found a unique way to warm up on Saturday morning! 6:00-10:30 - Team Check-In. All teams must bring a completed Team Check-In Form on Friday evening so tournament staff has contact info and hotel info for each team. Click HERE to download the form. If you are unable to bring this form on Friday, please e-mail it to director@shmrockfestival.org or fax it to 540-772-6874 before Friday. This is the only form we need so no need to provide signed roster sheets or anything else. All coaches who check-in on Friday evening in person will receive a coach’s gift too. Good bye Shamrock! We had a GREAT TIME! 4-0 after the 1st day, 6-2 overall (14-7 in sets) and 5th place in a 16's tournament! 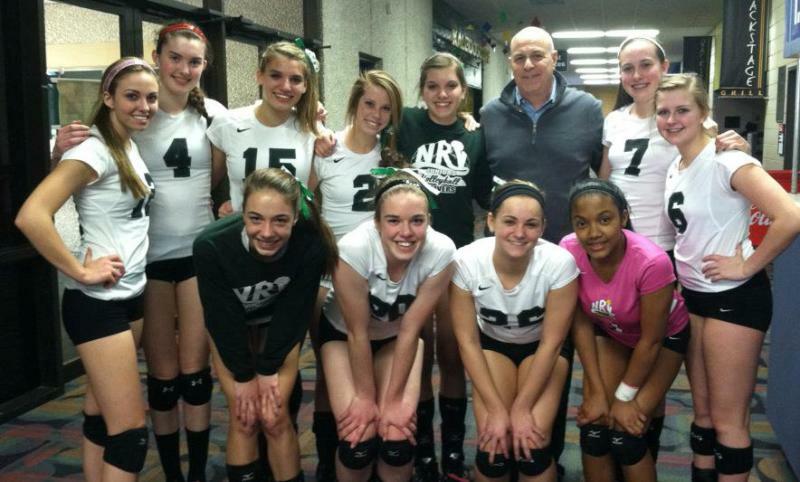 Roanoke 18's finished 2nd. NRV 18's (Maribeth & Elizabeth) won silver. Phoenix Rising lost in the final to the #1 seed, who went 9-0 for the weekend. Wow. Yorktowne 16 Gold (our first match Sunday morning) won silver. Evolution 16-1 (our first match of the tournament) won bronze. HOV 16N (Christina Dietz), 4-3 record. HOV 15N 4-3 lost 1st round bronze. TCA 15's 2-5, record, lost 1st round Emerald. Here is the email I received from Mark Tanis. Recruiting Showcase Participants are accepted - pending availability - when payment is received. You can see names here: (http://shamrockfestival.org/Showcase_Approved_Display.php). Final acceptances will occur in the days before the tournament begins so register online and/or send your check ASAP if you want to show your stuff to the many college coaches who will be recruiting at Shamrock. A complete list of the pre-registered schools is posted at www.shamrockfestival.org. New: We have now opened up the Showcase to 8th graders who want to get the experience of a Recruiting Showcase at a young age. Class of 2016 participants will only be accepted if there is still room next week as we do not want them to take spots from upperclassmen, however, as of today it appears that we will have room for some of them. Now a note from Coach Houser: Going to a showcase isn't something I recommend to freshmen. Sophomores, maybe. Why? There are usually almost no college coaches watching freshmen, and very few watching sophs. Most coaches in attendance will be D3 coaches who are looking at helping their teams next fall. * A 3-team pool at 11am on Saturday. * Another 3-team pool starting 5pm on Saturday. * A 3-team pool starting 8am Sunday. * Playoffs begin at approximately noon on Sunday.